Ed Hamilton was born in 1947 in Cincinnati, Ohio and is a resident of Louisville, Kentucky. Ed is a graduate of the Shawnee High School class of 1965 and a graduate of the Louisville School of Art class of 1969. While attending the University of Louisville and Spalding College in the early seventies, an opportunity came along that changed his life forever. While working on his certification to teach in the public school system, Ed met the late Sculptor, Barney Bright who he worked for as an apprentice and built a lasting friendship with while he continued his quest of having his own sculpting studio. and the Louisville Fund for the Arts. Ed is a former member of the Mayor’s Advisory Panel on Public Art and was previously appointed by the Governor to the Kentucky Military Museum in Frankfort, Kentucky and serves on the Executive board of the Thomas Clark Historical Center in Frankfort, Kentucky. In May of 2000 Ed received a Doctor of Humane Letters from Spalding University. On July 9, 2001 he was inducted in the Gallery of Great Black Kentuckians sponsored by the Kentucky Commission on Human Rights. On December 16, 2004 Ed received a Doctor of Arts Honorary Degree from the University of Louisville and was the commencement speaker. On December 18, 2004 Ed received an Honorary Doctor of Arts Degree from Western Kentucky University, Bowling Green Kentucky and was also the commencement speaker for ceremony. Ed has created and has received numerous awards. In 1980 he created the “Black Achievers Award” and in 1990 he was Black Achiever of the Year. In 1999 he was chosen as a Distinguished Achiever of the year. In 1996 he was the recipient of the Governor’s Artist Award in the Arts. He created the first “ Isaac Murphy Award,” given through the local NAACP and later given by Churchill Downs to selected community members. He created the annual ”Lift Award” for the Canaan Community Development Corporation and the Annual Smith Award given to newspapers in the USA commissioned by Bruce Fox Corporation in New Albany, Indiana. In May of 2005, he received the Arthur M. Walters Champion of Diversity Award given at the Louisville Urban League’s Diversity Soiree. In May 2005, he received the Urban League Diversity Award, and on June 27, 2005 he received the Best of Louisville Magazine 2005 Reader’s Choice Award for Visual Artist. In 2001 Hamilton was one of four jurors that selected the winning design for the Patriots Peace Memorial placed in Louisville, Kentucky and in 2005 Hamilton was one of eight jurors for the International Andrew Young Memorial in downtown Atlanta, Georgia. Hamilton has sculpted many works, his public work, the “Spirit of Freedom” is a National Memorial in the District of Columbia which achieved worldwide acclaim. The statue is a tribute to the Colored Soldiers and Sailors of the Civil War and stands at 10th and U Streets NW in Washington D.C. It was dedicated on July 18, 1998. ​Tree of Life Menorah on the exterior wall of The Temple in Louisville, Kentucky; a collaborative work with C. Robert Markert, artist, sculptor and friend of Ed's. 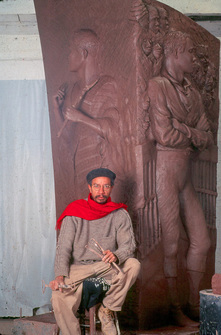 Hamilton has many works in both private and corporate collections including an original two foot model and a full bust of Sengbe Pieh from the courtroom side of the Amistad Memorial, and a bronze bust of a soldier from the Spirit of Freedom Memorial in the Speed Art Museum permanent collection in Louisville, Kentucky. In June of 2002 Speed Museum held an exhibit for Hamilton titled, “From the Other Side” and unveiled a sculpture in honor of the late Barbara S. Miller, who was chair of the Community Support and Outreach Committee and formerly chair of the Nominating and Education committees at Speed Museum. Ed is now a member of the Community Support and Outreach Committee of Speed Museum. The exhibit ”From the Other Side” ran from June 11, through December 29, 2002. City of Louisville under former Mayor David Armstrong. The unveiling was held on October 14, 2003. In May of 2004, a life-size frontier family sculpture titled “Migration to the West” was installed in the lobby of the new Frazier Historical Arms Museum, in downtown Louisville, KY. Ed participated in the exhibit titled, “Washington Symbol and City,” which opened October 7, 2004 - 2009 highlighting Monuments of Washington DC. On September 29, 2005 Hamilton was one of nine honored as the 2005 Alumni Fellows, at the University of Louisville’s 2005 Alumni Awards Presentation during homecoming weekend. One of Hamilton’s commissions was a bronze plaque of Owsley Brown Frazier, President of the Frazier Historical Arms Museum, commissioned by the University of Louisville Athletic Department. The Abraham Lincoln Memorial at Waterfront Plaza was done at the behest of the Downtown Development Corporation, Louisville Kentucky. The memorial consists of a twelve-ft. scale bronze of Abraham Lincoln as he is sitting on a sculpted rock. Also there are four bas-relief bronze plaques, 4x6 scale. The Lincoln Memorial was dedicated on June 4, 2009 at Waterfront Park, Louisville Kentucky. In February of 2006, Ed Hamilton published his book, “The Birth of an Artist, a journey of discovery”. This book outlines his journey from growing up in the city of Louisville Kentucky; becoming a sculptor and a secret that changed his sense of self forever. Published by Evanston Publishing of Chicago Spectrum Press. June 2009 Ed Hamilton published his second book, "Creating the Lincoln Memorial at Waterfront Park." Outlining the creative process of the heroic scale Lincoln and the four bas-reliefs that tell the story of Abraham Lincoln.